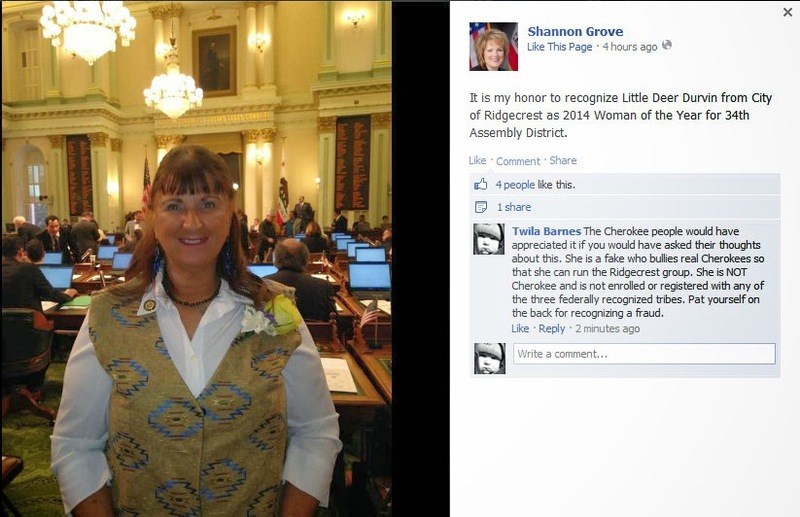 "Little Deer Durvin has been named “Woman of the Year” for the 34th Assembly District of the California State Legislature" according to the article, "Grove names Durvin Woman of the Year for 34th Assembly District " by Linda Saholt. 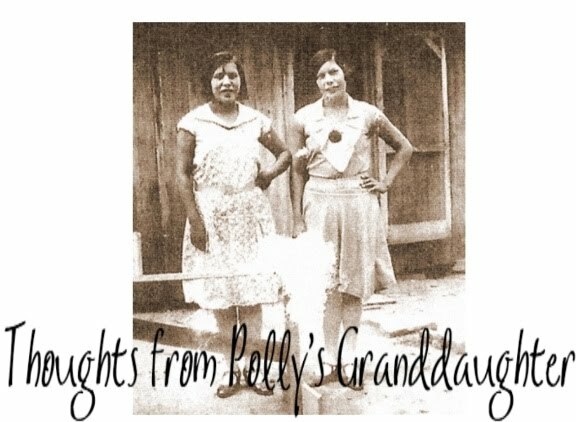 Statements in the article include "Born in North Carolina on a Cherokee reservation, she came to Ridgecrest in 1972 with her young children," and "She volunteers her time to go to local schools, clubs, and senior facilities to give presentations on Cherokee culture." 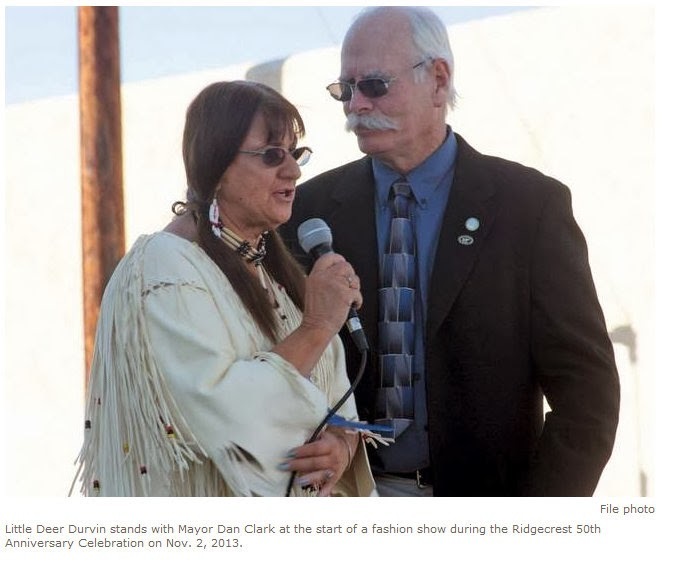 In another article titled, "Little Deer is Woman of the Year" by Jack Barnwell, it is stated, when discussing her being a representative for Ridgecrest of the Cherokee Community of Central California, "I try to educate the people about the Cherokee way and all Native Americans,” Durvin said. “I was very excited and honored to be named the representative." There's only one problem with all of this. Carolyn Emerson Durvin is NOT Cherokee. 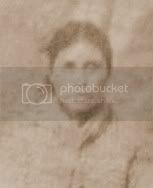 She is NOT registered or enrolled with ANY of the three federally recognized Cherokee tribes and she has no real knowledge of Cherokee culture or tradition. She's a con woman who has lied and fooled many people, apparently now even the California State Legislature. The second article includes a picture of Durvin in some kind of attire in a "fashion show". This kind of attire might fool non-Indian folks, but Cherokees know, there is nothing "Cherokee" about what that woman is wearing. Enough is enough. How much is this fraud going to be able to get away with? If California wants to honor an American Indian, shouldn't they honor a real one? Geez Louise people, get a clue! For more information on the fraud this woman is perpetuating, please see my post about her at this link. Link to Shannon Grove's facebook page where she has posted a picture of Carolyn Durvin. 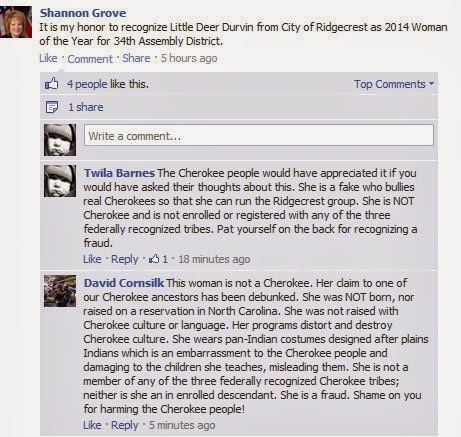 After at least two comments were left on Shannon Grove's facebook page explaining how real Cherokees feel about her recognizing the fraud, Carolyn Durvin, our comments were deleted. Here are two screen shots of her page, before the comments were removed.